Definitely not ‘just a high pile of rocks’ , for those who listens She has a very strong voice. And again : You can hear and feel that , just watching this picture. Wonderful. 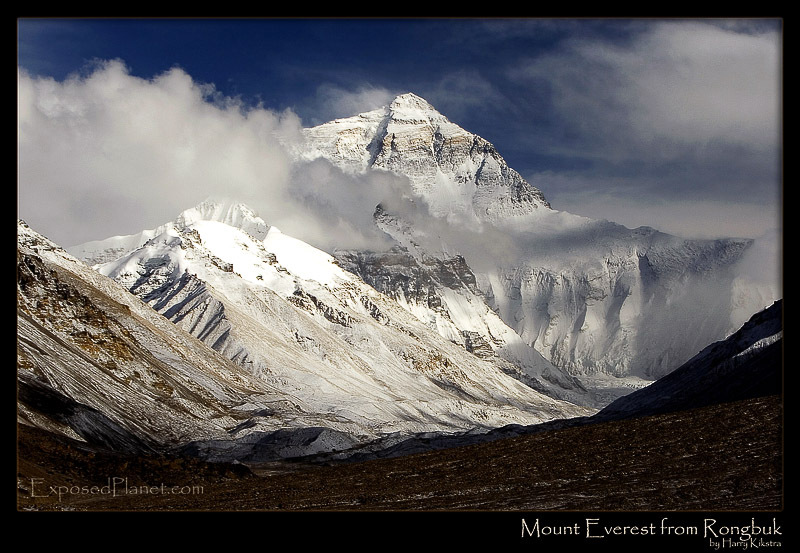 Everytime I see a photo of Everest as beautiful as this one…I dream. Everest may be the one dream I do not accomplish in my lifetime and I am at peace with that. But I still dream……..
U know what your photograps force me to think today — in bengali "Mone hoy baler chakri chere die, ekta bochka pithe nie berie pori!!!" (meaning, I thought of leaving the damn job I\'m doing & go out to places with a bag on my back). Thanks a lot for these beautiful pix!!! The story behind "Everest from Rongbuk Monastery"
About 8km from Basecamp and more than 25 from the summit of the world, the Chinese have built a hideous hotel. Next to the Rongbuk Monastery the red building stand out from the colourless surroundings as a sore on a clear skin. They serve great noodles though and from the balcony the view is one of the best in the world as you can see above. After a recent snowstorm the clouds parted and while the sun was already setting the Mother Goddess of the Earth revealed herself. Maybe just a damn high pile of rocks for others, a wonderful and spiritual place for me. About 8km from Basecamp and more than 25 from the summit of the world, the Chinese have built a hideous hotel. Next to the Rongbuk Monastery the red building stand out from the colourless surroundings as a sore on a clear skin.They serve great noodles though and from the balcony the view is one of the best in the world as you can see above.